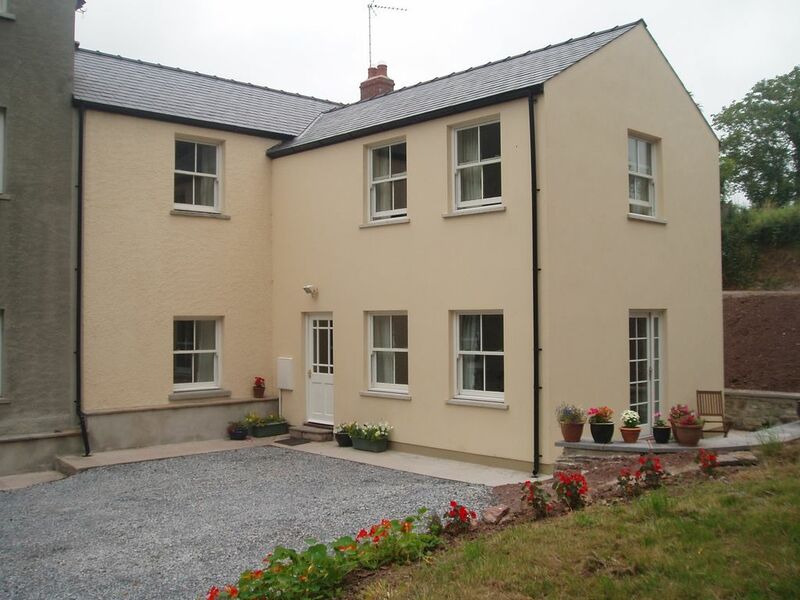 3 bed, 2 bath cottage close to the coast and attractions of South Pembs. Ty Fynnon Cottage (Well House) at North Down, Pembrokeshire is a superb cottage that can sleep 6 in 3 bedrooms, 2 large doubles (1 with en-suite) and 1 with twin beds. All beds are made up ready for your arrival using crisp white hotel quality bedlinen and large fluffy towels are provided for all guests. The bedrooms all have lovely views of the gardens and countryside. The rooms are spacious and well designed. There are extensive lawns and grounds at North Down which guests are welcome to make use of. Children love the rope swing and playing on the lawns. North Down is very tranquil and set far from the road on its own drive. The cottage is close to the beautiful beaches of the Pembrokeshire Coast National Park. The local area: Our nearest beach is Freshwater East a lovely south facing wide sandy shore backed by sand dunes. There are boat launching facilities here, a large car park, toilets, disabled access, a shop and cafe. A little further along the coast is Manorbier a pretty village with a medieval castle. The beach is a magnet for surfers looking to catch the large Atlantic swells and is great for rock pooling, sunbathing and swimming. Again there are toilets, a large car park and an easy access path to the beach. In the village you will find a shop, cafe and pub. The castle is open to the public. The historic walled town of Pembroke is two kilometres away. There is a magnificent castle here (one of the best preserved in Wales) and it is the birth place of Henry VII. There is a wide variety of small independent shops, cafes and restaurants. Days out: There are several theme parks within easy driving distance (less than 30 min). The largest is Oakwood with its roller coasters, thrill rides and family entertainment. Next door to Oakwood is the Blue Lagoon - a large indoor pool complex with water slides and waves machines - great for a rainy day. Folly Farm near Narberth is another great family day out with many animal based attractions including Wales' only giraffes. Closer to home is Heatherton where you will find the Tree Top Trail, baseball cages, a golf driving range, horse riding and an indoor soft play area for the little ones. Manor Park - Anna Ryder Richardson's Wild Welsh Zoo - is a 15 minute drive away. In Pembroke there is a large leisure centre with indoor pool, squash and tennis courts and a gym. The local village and Pembrokeshire: Lamphey is a pretty Pembrokeshire village steeped in history and a pleasant 20 minute walk from North Down. The Bishop's Palace is a scheduled ancient monument and a site of national historical importance. There are two pubs both offering a wide selection of meals, a shop, artisan bakery, hairdresser, train station and bus stop. The village cricket team plays most Saturdays during the summer and there is a tennis club with two courts. Next to the cricket pitch is a well equipped children's play area. Pembrokeshire is Britain's only coastal National Park with a multitude of safe family beaches, many of which have been awarded Blue Flag status. North Down is close to the Pembrokeshire Coast Path a National Trail, 186 miles in total it stretches from Amroth in the South to St Dogmaels in the North. Walkers are very welcome and lifts to and from the path can be arranged for a small extra charge. Hi we are the Hodgson family and we have lived at North Down for ten years. We love welcoming guests to our holiday cottage and have made some good friends over the years with families who have returned to stay with us. We would love to welcome you and your family to North Down and can assure you of some really warm Welsh hospitality. Look forward to seeing you soon! We love living at North Down, it is out in the country so very quiet, yet we are just a short drive to Pembroke and the wonderful castle and the coast is a five min drive away. The gardens at North Down are lovely and the views go on forever. When we moved in there was a lot of work to do at North Down, but we have brought the building back to life and we love sharing our home and cottage with guests from all over the world. We have a large box of beach equipment, surf boards, wet suits (various sizes). Our local farm shop at Yerbeston will deliver to the cottage ready for your arrival. This is their web address http://www.farmshopfood.co.uk/index.php Our nearest large supermarket is Tescos in Pembroke Dock (approx 4 miles) if you want to use their internet shopping facility we will be more than happy to take delivery and put perishables in the fridge on the day of your arrival. We have lots of space at North Down and their is ample room to park a boat should you wish to bring one. Walkers are very welcome and we can arrange lifts to and from the Coast Path National Trail and the many inland paths that are close by. Luggage transfers are also available for people walking the long distance path. An extra charge will apply. We enjoyed our short break at the cottage very much. It was clean and warm and welcoming. The rooms were spacious and the beds were very comfortable. Tessa was a welcoming host with lovely attention to detail which gave us a happy and relaxing holiday. The area is beautiful and we particularly enjoyed Freshwater East beach and the castle at Pembroke. We had a truly wonderful time in this cottage. The rooms are all a good size, warm and clean. The property is well appointed and Tessa was very friendly and helpful throughout our stay. We would highly recommend this cottage. Suitable for young children too. Comfortable, spacious and with everything we needed. We had a wonderful time in this spacious, clean and comfortable cottage. It is a short drive to Freshwater East beach, a beautiful unspoilt beach. We also went kayaking, horseriding and visited 2 of the 3 castles in the area. A great base for a holiday in Pembrokeshire. Ty Fynnon is easily the nicest holiday home we've stayed in, and Tessa the most welcoming and generous host. The cottage is clean, spacious for a group of 6, well laid out and well equipped. The kids had fun collecting eggs in the morning, and we loved the freshly dug up spuds and other vegetables from the kitchen garden. We used the cottage as a base for walks in the Pembrokeshire Coast National Park, visits to beaches and castles. One of the highlights was seal spotting at Marloes / Deer Park. Highly recommended! Dear Eva, thank you so much for the positive review. I'm really glad you and your family enjoyed your holiday. Thanks and hope to see you again soon. Kind regards Tessa & family. North Down Farm is located in the beautiful Welsh county of Pembrokeshire, close to the national park with its stunning beaches and scenery. The pretty village of Lamphey with its Church and Bishop’s Palace is a twenty minute walk away. The village has a shop, garage, bakery, hairdresser, train station, bus stop and two public houses both providing food. The historic walled town of Pembroke with its imposing castle is two miles away. Here you will find a wide range of shops, cafés and restaurants. The nearest beach is a five minute drive away at Freshwater East. Also within easy distance are Manorbier, Broad Haven and Barafundle. The popular resort town of Tenby is a twenty minute drive away, you can also get there by train or bus. Tenby offers a wide selection of activities with award winning beaches, you can also book boat and fishing trips. The attractions of Heatherton, Oakwood, Manor Park and Folly Farm are all within a 30 minute drive. Golf: There is an 18 hole course at Pembroke Dock (about 5km), a championship links course at Tenby (10km), and a country park course at Trefloyne (10km).